I went through my pantry and freezer and thought it was time to do a little spring cleaning. 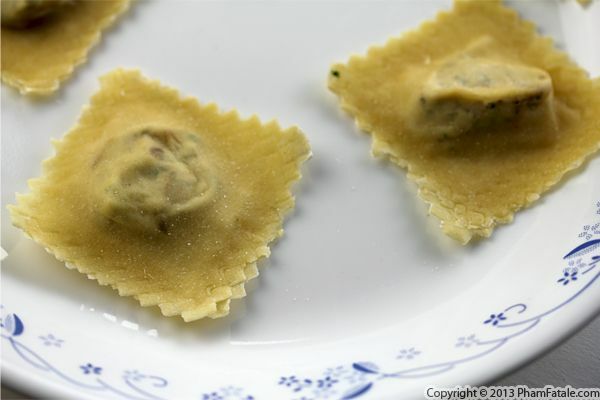 I decided to make ravioli and filled them with the duck confit I had in the freezer, along with ricotta cheese, Pecorino cheese, cider, apples, morel mushrooms and tarragon. I ended up making two large batches of the homemade pasta: one vegetarian and one with the shredded duck inside. My preference leans toward the meat version, but my husband Lulu who's a vegetarian enjoyed the other version as much as I did! If you're looking for a vibrantly green dish to serve this St. Patrick’s Day, this kale cashew pesto fits the bill. To the kale I added Greek Myzithra cheese (unpasteurized sheep cheese) and cashew nuts. Pesto is a very versatile sauce that provides as much flexibility as it does flavor. You just have to keep in mind 3 main elements: greens, nuts and hard cheese. 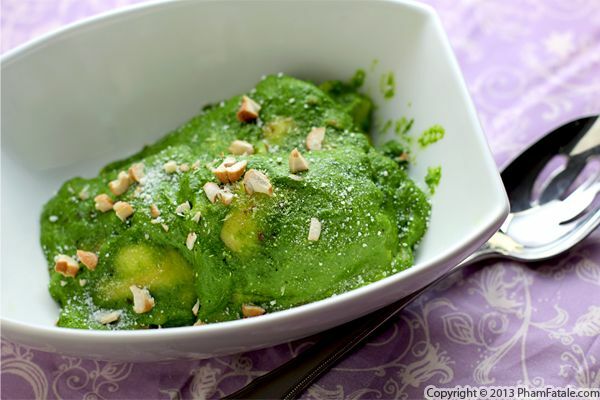 The inspiration for this pesto came from Gary, a PhamFatale.com reader. 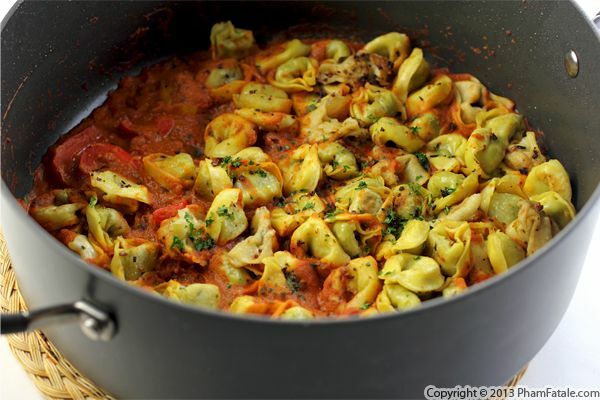 Gary had sent me an email for guidance about a sauce for ravioli he had purchased at my favorite local market, The Milk Pail in Mountain View (by the way, if you live in the Bay Area, don't hesitate to shop there and show your support!). Gary bought the Milk Pail's specialty Thai Curry ravioli and didn't know what sauce to serve on the pasta. At his house, no one's keen on a milk-based sauce so he was looking for something with less milk or cream. I suggested a pesto made of flat-leaf parsley, Thai Curry cheddar cheese (using the same kind of cheese as in the ravioli filling) and peanuts. I'll post the recipe soon. 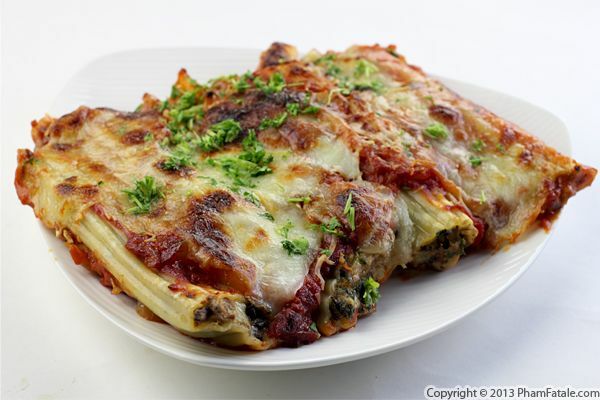 Gary's family tried the pesto ravioli over the weekend and it got two thumbs up. Yay! Mary Garrigan from Rapid City Journal published a couple of St. Patrick’s Day-friendly recipes from my first book, Haute Potato. Check them out if you’re still in search of St. Patrick’s Day recipes! I hope your long President's Day weekend was a lovely as ours. We had some company on Saturday and had a relaxing Sunday and Monday. Yesterday, we made a few appetizers and mostly snacked on these bite-size finger foods and a few sweets throughout the day. By the evening, I still felt pretty full and assumed everyone else was too, but I was so wrong. I ran into the kitchen and improvised a meal with one Portobello mushroom, ricotta cheese, manicotti pasta shells, tomato sauce and a jar of peach jalapeno preserves from our friend Martha at San Saba River Pecan Company. I completed a salad and mushroom manicotti dish in less than 40 minutes. The challenge was to turn a handful of key ingredients into a dish as fast as possible before baby Aria woke up from her afternoon nap. Come to think of it, that sounds like a fun Food Network Challenge! At any rate, I'm proud to report my husband Lulu and family absolutely loved the dishes. I’ll share the salad with you soon. Since I gave birth to Aria 13 months ago, I've been determined to shed the weight I had gained during pregnancy. It took 9 months to gain the weight, so I knew it was going to take quite some time, perhaps even longer to lose it all. Part of my strategy has been to eat vegetarian 2 to 3 times a week. As you can imagine, this has made my husband Lulu (who is a vegetarian) very, very happy. “Halfway there,” he says. One of my favorite dishes to make on veggie days is gluten-free quinoa pasta. The pasta is awesome. It has a different texture, but I really enjoy it. 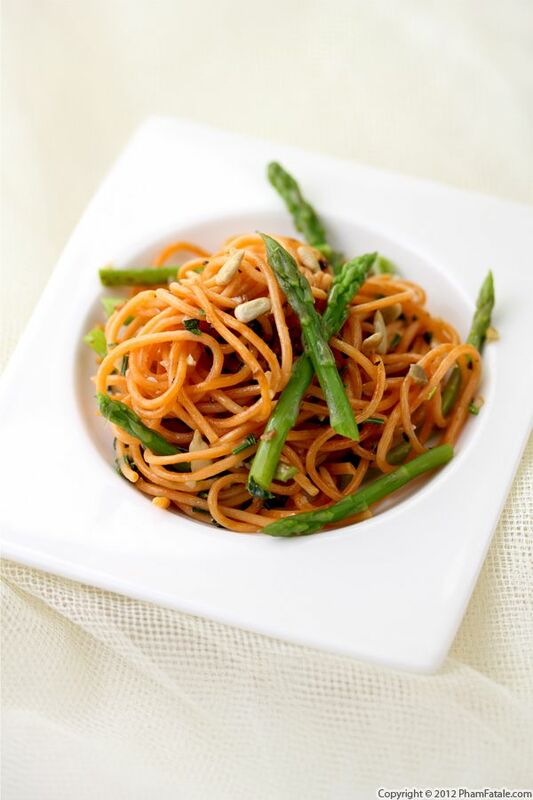 For this dish, I sauteed tomato-flavored quinoa spaghetti in garlicky baby asparagus spears and added sunflower seeds as the main source of protein. I’ll be eating this dish even after I reach my target weight, but I’ll be sure to throw in some meatballs or chicken breast (and of course, I’ll share the recipe). Sorry, Lulu! Page 16 of 21 pages.